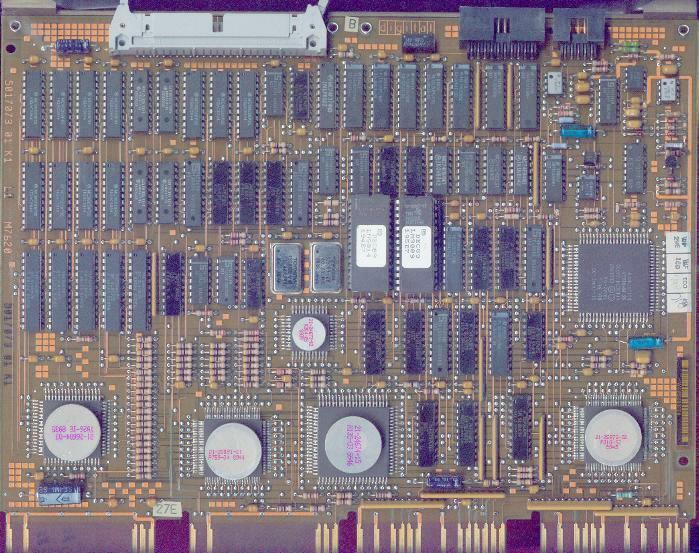 The M7620 KA650-A CPU module was used in MicroVAX 3500 and 3600 systems, while the KA650-B was the heart of the VAXstation 3200 and 3500. The KA650-B is unctionally equivalent to the -A version, the difference is the single-user VMS and Ultrix license shipped with it. The heart of the module is the CVAX chip, which contains 180.000 transistors and runs at 22 MHz. There are support chips for clock, floating-point accelerator (70 instructions, 32 other are simulated in software), memory management and qbus interfacing. The processor also utilizes 1 Kbyte first-level write-through cache memory (90 ns cycle) and 64 Kbyte second-level cache. The module also includes a system support chip (SSC) which provide console and boot code support, console serial line, interval timer, time-of-year clock, and some other functions. The processor's resident firmware consists of 128 KByte code stored in two 27512 EPROMs. It provides services for self testing, initialization, console command language (CCL), bootstraps. The KA650 CPU features LMI (Local Memory Interconnect), which uses three different paths to system memory: the qbus, the C-D interconnect of the backplane (thus it must be fitted into a Q22/CD backplane, which is usually a BA215 enclosure with a straight-down Q22/C-D backplane, but it can also be used in the first few Q22/C-D slots of a BA23 or BA123, in which case the system is sometimes nicknamed "MicroVAX III"), and a ribbon cable that connects the CPU module to MS650 or compatible third-party memory boards. This means, that you can use qbus memory cards with the KA650 (although it results in weaker performance), or you can use LMI MicroVAX III memory modules. Do not try to use LMI memory modules intended for earlier MicroVAX systems (modules of the MS630-series, etc)! The CPU module should go into the first slot of the backplane, the LMI memory boards should be next. The maximal memory amount is 64 MBytes, although this is limited to 48 MB in VAXstations. All three cables are straight-through ribbon cables, nothing special. Next, if the Power-up Mode Switch on the CPU Cover/Patch Panel is in the Language Query position, or the previous value was lost due to failure of the back-up battery unit, the firmware asks for the language to use in console messages. After that, a sequence of tests is executed. On some (earlier) versions of the firmware, the countdown starts at 30 instead of 40 as shown here. "16" is the number of the test that bombed. "2" is the severity factor. "2" causes the register dumps to be displayed and the autoboot prohibited. "1" just prints this erro message line, and doesn't disables the autboot functionality. "FF" is the code of the error found. FF: normal error exit form diag, FE: unanicipated interrupt, FD: interrupt in cleanup mode, FC: interrupt in interrupt handler, FB: test script requirements not met, FA: no such diagnostics, EF: unanticipated exception in executive. "0000" is the total number of errors encountered. No default boot device has been specified. This countdown is also displayed on the LEDs of the Cover/Patch Panel and on LEDs on the CPU module. If there's nothing on the console display, nor on the hex LED display, check if the CPU's in place, check the cable from the CPU module to the bulkhead panel. I've experienced some silly behaviour when using too long ribbon cables between the CPU and the Patch Panel... I you cannot use the computer, as it loops through the tests, check if the power-on mode switch on the Patch panel is in the "test loop" position. Although I mentioned this earlier, I'll do it again: don't use MS630 or compatible memory boards with the KA650 (it would not be that easy anyway, the connectors are in line to warn you! The H3600-SA is a special I/O panel covering the CPU and the first memory module. It's used in the BA2xx-series of enclosures (also called the "S-box"). On the inside, it has a one-piece ribbon cable which plugs into the SLU and bulkhead panel connectors (J1 and J2) on the KA650, the battery back-up unit (BBU, a battery pack) and a rotary switch for baud rate selection. 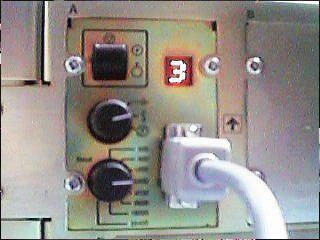 On the outside there's a hex LED display, the power-up mode switch (Halt enable/disable, the upper position is "enabled"), a recessed rotary switch for language selection ("face" for language inquery, "arrow" for normal operation, "T in circle" for loopback test), and the SLU connector, which is a modified modular jack (MMJ), which can be used with the Digital "office cable" equipment, or you can break off the little "twitch" of a normal phone cable with MJs on both ends (the MMJ is just like a normal phone connector with this twitch off-center) so that it fits (although it will slide out quite easily). The newer Digital CRT terminals (VT320 and above) all have MMJ connectors ("DEC423" in the configuration menus), on VTs with a normal DB25 connector you must use a converter. Picture 2: The CPU Patch Panel, sometimes called the "bulkhead"
The two-position switch is for halt enable/disable ("dot in circle" is enabled). This is in general a null modem cable (pins 2-3, 3-2, 7-7, with the 8th and 9th pin on the VAX-side shorted; speaking from experience, you don't need all the pins that are connected in the BCC08 cable). You can enter bootstrap/diagnostic commands form this prompt (e.g. you can play around with memory locations, registers, etc), up to 80 characters once. Commands can be abbreviated. Note: some of these comands may not be present in earlier firmware versions. Boots the specified device (DUxy for disks where x is the controller number, y is the disk on that controller, MUxy for TMSCP tapes (in the same manner) XQA0 or XQB0 for Ethernet). If no device is pecified, the system goes through the sequence discussed at power-up tests. Qualifier: /R5:<value> - the <value> gets passed to VMB (primary boot loader). If you enter "BOOT" alone, the console goes through the normal bootstraping procedure. A default boot device can be given with SET BOOT <DEVICE>. Default boot flags can be set with SET BFLG <FLAG> . This is a utility that is similar to the VMS SYSGEN program: it generates a table of CSR and vector addresses of devices entered interactively. The CPU starts instruction execution from the address in the PC (Program Counter). No initialization is performed. Deposits <data> into the address specified. Special address specifications include PSL (Processor Status Longword), PC, SP (Stack Pointer), Rx for register #x, + for the next location (counted in the unit given with the qualifier), - the previous location, * the last referenced location. Qualifiers: /b data size is byte, /w data size us word, /l data size is longword, /v address is in the virtual address space, /p physical memory, /i internal processor register, /g general register, /u access to console program memory locations, /N:<count> range of the operation. Examines the data at the given address. The qualifiers are the same as with DEPOSIT. No effect, as the processor is in the halt state when in console I/O mode. Displays a list of commands and their arguments. Moves the block of memory starting at <src address> to a block beginng at <dest address>. The data format qualifiers are the same as with DEPOSIT and EXAMINE. "Steps" the processors <n> macro instructions. If no count is specified, single-step is assumed. Repeats <command> until CTRL+C is pressed. Search for occurences of a pattern. The data size qualifier can be supllied as with DEPOSIT and EXAMINE. The mask is for not taking care of some bits: if you specify "1", bit 0 will be ignored. Sets the indicated parameter to <value>. The following console parameters will be accepted: BFLAG (boot flags), BOOT (default boot device), LANGUAGE (default language). SET HOST is using the DUP or MAINTENANCE driver on the selected node (intelligent storage controllers, such as the KFQSA DSSI adapter). Displyas the value of the parameter, which can be one of: BFLG (default boot flag), BOOT (default boot device), DEVICE (all devices in the system), ETHERNET (hardware address off Ethernet adapter), LANGUAGE (default console language), MEMORY (memory configuration, also accepts the /full switch), QBUS (all addresses that respond to an aligned word read), RLV12, UQSSP, VERSION (version of the firmware and VMB). The test identified by [test number] is invoked. If no number is specified, no test is performed. TEST 9E lists the available diagnostic tests. The commands can be abbreviated (e.g. it's enough to type I for INITIALIZE, etc). Later/other MicroVAX CPUs had more complex console commands. Whenever an error occures, the KA650 dumps a small error message on the console, which consist of a two-digit hexadecimal number, a small, abbriviated message, and the content of the PC. mapped NO ACCESS or NOT VALID. 07        SCB ERR3        The vector had bits <1:0> equal to 3. 08        SCB ERR2        The vector had bits <1:0> equal to 2.
trying to read an exception or interrupt vector. while trying to service a machine check. 22        ILL CMD         The command string cannot be parsed. 23        INV DGT         A number has an invalid digit. of the terminating carriage return. specified with an EXAMINE command. 28        UNK SW          The switch is unrecognized. 2B        HLTED           The operator entered a HALT command. 64 kb of good memory. 2E        MEM ERR         Parity error detected. 2F        UNXINT          An unexpected interrupt or exception occurred. 40        NOSUCHDEV       No bootable devices found. 41        DEVASSIGN       Device is not present. 42        NOSUCHFILE      Program image not found. 43        FILESTRUCT      Invalid boot device file structure. 44        BADCHKSUM       Bad checksum on header file. 45        BADFILEHDR      Bad file header. 46        BADIRECTORY     Bad directory file. 47        FILNOTCNTG      Invalid program image file. 48        ENDOFFILE       Premature end of file encountered. 49        BADFILENAME     Bad file name given. 4A        BUFFEROVF       Program image does not fit in available memory. 4B        CTRLERR         Boot device I/O error. 4C        DEVINACT        Failed to initialize boot device. 4D        DEVOFFLINE      Device is offline. 4E        MEMERR          Memory initialization error. 4F        SCBINT          Unexpected SCB exception or machine check. 51        NOROM           No valid ROM image found. 52        NOSUCHNODE      No response from load server. 53        INSFMAPREG      Invalid memory configuration. 54        RETRY           No devices bootable, retrying.